Ryan Mitchell has spent the last two years building his dream home. It's no bigger than a backyard tool shed, and he'll go to the bathroom in a bucket. He doesn't seem like the type who would give up modern conveniences with such rigor. Glasses frame his round, boyish face, which turns pink when he explains the details of a composting toilet. He has a master's in human resources and drives a Smart Car. But in a few weeks, he'll move out of his one-bedroom apartment and into the 150-square-foot "tiny house" he's been building in north Charlotte. Mitchell, 29, founded The Tiny Life, a blog that explains in magnificent detail how to construct a tiny home and minimize your life accordingly. It's the fourth of more than 400,000,000 Google search results for "tiny house." He's organizing the world's first Tiny House Conference, April 5-6 in Charlotte, where hundreds will gather at the McDowell Nature Preserve to learn more about the downsized lifestyle, which can, but doesn't have to, include producing your own food (homesteading) and building a tiny home with environmentally sustainable materials. But as a leading advocate of the tiny-house movement, even he struggles to define it. 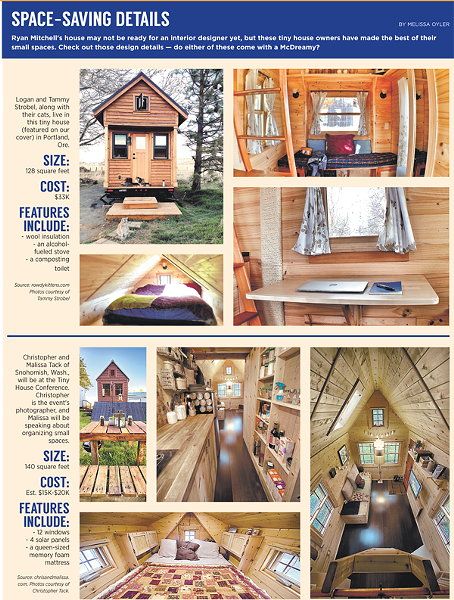 Some call tiny houses a response to the McMansion, but they're more than that. Tiny homes represent a philosophy, that in some ways gained popularity after the 2008 recession but in other ways has existed since the world became too small for its inhabitants. It's constantly inspecting and reinspecting the way you live and the space you occupy. It's being aware of what you own and how much you own and not being a slave to your possessions. Mitchell, whose construction experience is limited to an 8th grade shop class, is the first to admit it's a little crazy. Taking to the woods every chance he gets to build himself a home no larger than a bathroom. Defecating in a bucket. But fear is an effective motivator. In 2008, he was on his way to beginning a career in the corporate world. He had just finished grad school and quickly landed a job. Within six months of that most economically turbulent year, the company shut its doors. He found another job without much trouble, but the experience shook him enough to send him into an intense period of introspection. "It just woke me up to the fact that I needed to be able to handle those little curve balls — big curve balls — that life threw at me." He tracked his spending and noticed housing took up the biggest chunk. "So I said, 'OK, well, crazy question: How can I just eliminate my housing costs?'" The Internet introduced him to a few news stories about tiny houses. He didn't find any blogs, particularly any that explained the construction process, so he launched one himself. (This is the same guy who started his own chicken co-op, where members tend the feathered flock a few days a year in exchange for fresh eggs.) He saw his first tiny house during a road trip to New Hampshire and decided that after he had raised enough capital, he'd build his own. SIX YEARS LATER, Mitchell's almost-finished tiny house is a hodgepodge of pieces that make it uncategorizable. It almost has a Frankenstein feel to it. The structure looks as interesting as a tool shed, but a short side of the rectangle features a homey front door. The red metal roof peaks like a steeple, and windows give it an airy feel. His "bedroom" is a lofted section on the opposite end of the front door. Accessible by a bunk-bed ladder, it's big enough to fit a small mattress. Underneath his bed will be a standing shower. Next to it, a small "kitchen," or about enough space to man a small stove top and open a mini fridge. The foundation is a trailer bed with wheels attached. The Tiny Life is now just one of dozens of blogs about tiny houses, offering advice on the construction process and acquiring land, general info on living a simpler life and tips to circumventing zoning rules. Most cities, including Charlotte, have no idea how to categorize tiny houses. Many are mobile, including Mitchell's, but utilize the local power grid and water system. Some are totally off the grid. Before taking me to his tiny house, I meet him for the first time in a coffee shop. Every part of him looks like he belongs in the cushy leather chair, sipping from an iced drink, not outside wielding hammers and hand drills. He's dressed plainly, in jeans and a dark jacket, and adjusts his glasses from time to time. His outfit doesn't make much of a statement, other than maybe he doesn't like to shop. But what he's wearing is intentional. In December, he blogged about the dilemma of cleaning his clothes as a tiny-house occupant. Washers and dryers are luxuries that take up a lot of space, so options are handwashing or taking trips to the laundromat. To adjust, he's pared down his closet to about two or three sock drawers' worth of clothing. In that blog post, he published a list of what he owns, which includes seven shirts, two pairs of pants, one belt (reversible). Building a tiny life is like assembling a Porsche — the smaller the package, the more important the details. Details are another reason Mitchell opted to build his own tiny house. He's been able to control every step of the construction process, including selecting environmentally sustainable building materials. But what he has gained in green points he hasn't sacrificed in durability. The city rates insulation in an "R" value. 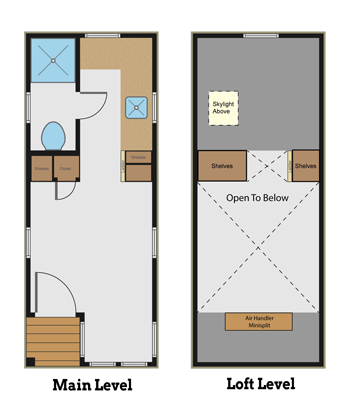 RVs typically come in at an R4 — the equivalent of piling up a lot of cardboard. The average home in Charlotte is an R13. Mitchell made his tiny house an R20. Such a forward-thinking, hands-on approach to living is why Sarah Baird is excited about the tiny-house movement. Baird is the spokeswoman for The Center for a New American Dream, the Washington, D.C.-based nonprofit that aims to debunk the assumption that living the "American Dream" requires building mansions, buying the latest gadgets and driving the nicest cars. "We think [the Dream] means building community, being a conscious consumer and protecting the environment." Again, it's a concept that has existed for years, just in different terms. Baird saw it growing up in rural Kentucky around farmers. "People who live in these types of communities know how to share, to embrace this American Dream, where the focus isn't on stuff." 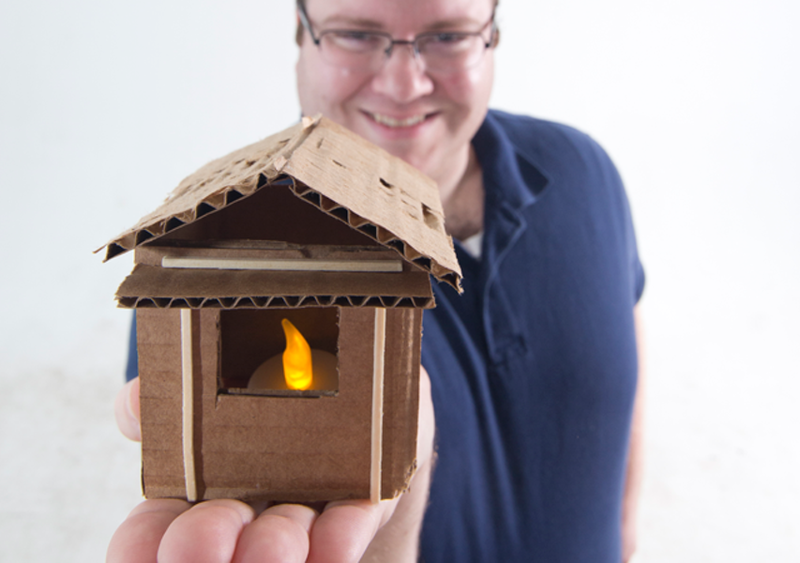 Not everyone is willing to give up their apartment or home for a tiny house, so the Center's website offers practical tips to tackling over-consumption, including a "Wallet Buddy," a small printable slip of paper with a few questions users can attach to their money holders and reference just before making a purchase. Questions include, do I need this, and do I need this now? Was it made sustainably? Glancing at it just before the purchase is key; our desire to have whatever we're buying is so strong, it supersedes our logical thinking process. "Researchers show that the point where you're the most excited about buying a purchase is right before you pay for it," Baird says. WHEN MITCHELL IS DONE building his tiny house, he'll hitch the trailer bed onto a truck, drive it down the highway and park it on 26 acres of land about 10 minutes away from Uptown. He'll utilize the city's power grid and water, and for the land, he'll spare a dollar a year and a few hours a week working on his landlord's business' website. Living rent-free will more than compensate the time and energy he's invested into construction. He brought an electrician to look over his work and someone to install the roof; otherwise, he's done everything himself. He's pored over countless YouTube videos, interviewed contractors and hauled material between home-building stores and the plot of land a family friend lent him for construction. (Cell phones inevitably whip out when he packs his Smart Car with long wooden beams at Lowe's.) For every hour of construction, he's probably invested two in research. "I think the irony is, we focus so much on a tiny house, but honestly it's a really small part of what it really is. Really, it's a vehicle to lead you to a life that suits you better. That empowers you, that taps into your passions and gives you free time to pursue them." He brings up a fellow tiny houser in D.C. who works a government job six months out of the year for the paychecks. The other six, she travels the world, working for different NGOs for free. "That just keeps her happy. Then she'll come back to her job in D.C., make the money that she needs to live, and it's a lifestyle that suits her," Mitchell says. Another example he offers is a friend who lives in a tiny house on a horse ranch on the California coast. In exchange for taking care of the horses for free, she rents some of the most expensive property in the world for $500 a month. Mitchell didn't start the project rich. 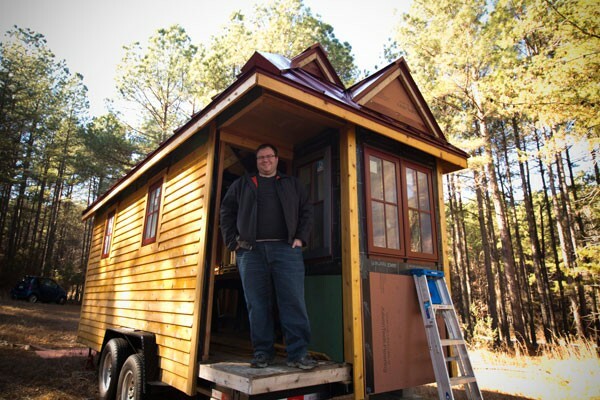 After seeing a tiny house for the first time in 2008, it took him four years to start construction and more than two to earn the money to finish it. He did have enough on the side to buy building materials, a luxury many can't afford. But it's all about perspective. Sarah Susanka, an architect in Raleigh, published The Not So Big House in 1998. It's not about tiny houses exactly, but it is a guide to re-examining space. Once, after a conference, an audience member approached Susanka to thank her for giving her ideas to make her trailer better. "That's not my typical audience," Susanka says, "but what it taught me is that it's applicable for everyone." The book asks readers to think about rarely used space in their homes — a formal dining room, for example — and offers simple repurposing tips. Eliminating formal furniture is one option, tearing down walls to make space bigger another. It can even be as simple as incorporating a comfortable chair and some games into a dead corner, Susanka says. "The feeling of home has nothing to do with size." The Tiny House Conference happens April 5-6 at McDowell Nature Preserve, 15222 York Road. To register to attend, visit www.tinyhouseconference.com.